The Powerfarm Cab and Platform tractor range features a clean and modern design. The new, environment-friendly Perkins 1104D series engines fitted on the Powerfarm Cab models offer high torque backup and improved fuel efficiency. They meet the Tier 3 emission standard and deliver 74, 83, 92.5 and 102 HP (ISO rating). These engines feature an advanced fuel injection system that optimises air-fuel mixture, thereby improving combustion and engine efficiency. The modular transmission provides, as standard, three ranges and four speeds in each range, resulting in a total of 12 forward and 12 reverse speeds with mechanical synchro shuttle. The standard gearbox can be combined with either an underdrive (only for 2WD versions) or a creep option to provide 24 forward and 12 reverse gears with a maximum speed of 30 km/h. The height adjustable sprung seat and the hood with its rounded and plunging design provide excellent visibility when manoeuvring. 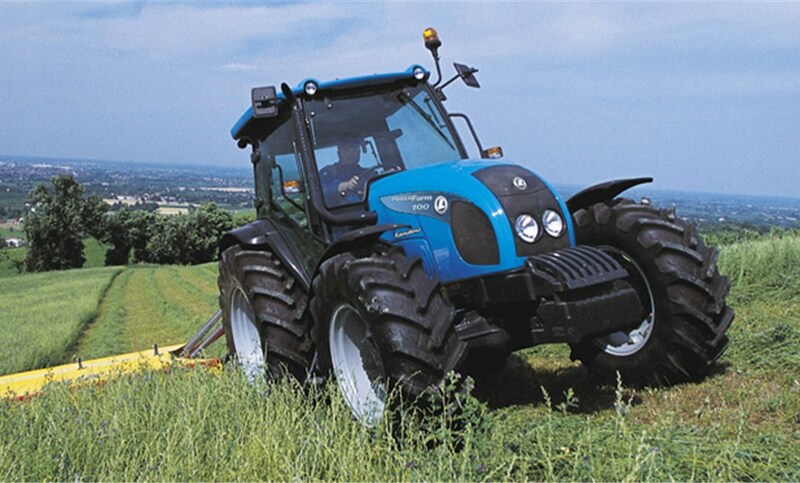 The tractor range comprises four models equipped with different engines and offers a choice of three transmissions and two cab styles for enhanced versatility, maximum comfort and increased productivity. 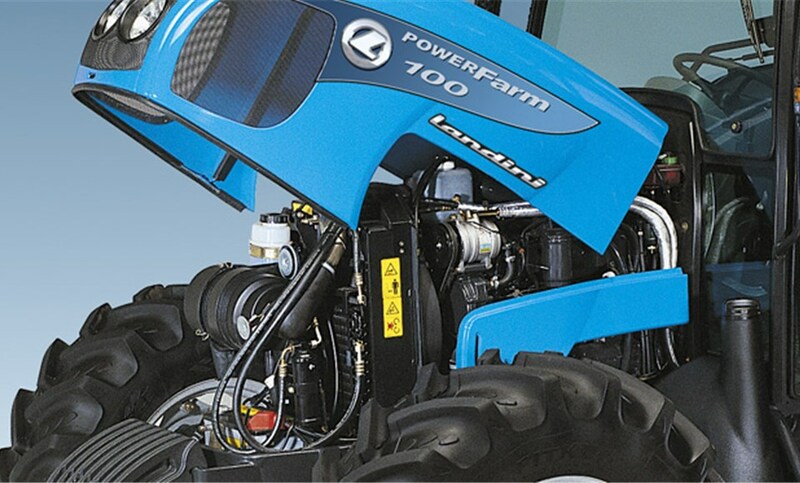 The Powerfarm tractors are powered by a new range of advanced, environment friendly engines that provide low emission levels in accordance with the Tier 3 standards. Specially designed for farming applications, the new Perkins 1104d are modern engines that provide state-of-theart technology and solutions. advanced fuel injection system that optimises air-fuel mixture , thereby improving combustion and engine efficiency. The modular standard transmission (speed four) provides 3 ranges and 4 speeds in each range, resulting in a total of 12 forward and 12 reverse speeds with mechanical synchro shuttle. The standard gearbox can be combined with either an underdrive (only for 2wd versions) or a creep option to provide 24 forward and 12 reverse gears with a maximum speed of 30 km/h. An overdrive option is also available for 4wd models to provide 24/12 gears with 40 km/h maximum speed. 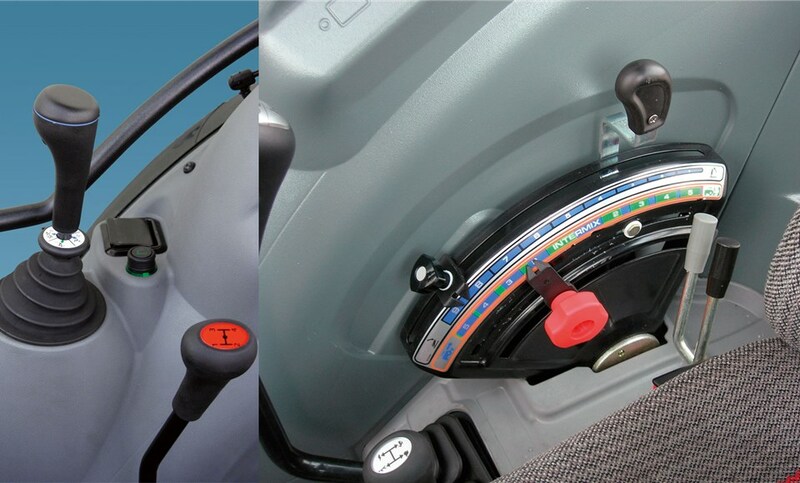 The synchro shuttle lever is conveniently located to the driver’s left to enable easy direction changes. The same lever can be used to alternately engage the underdrive, creep or overdrive option. The first thing you appreciate when you step into the “total view” cab is the superb all-round visibility offered by the fully-glazed rear-hinged side doors. The cab interior is finished with modern composite materials from the automotive industry. All controls are logically-arranged and conveniently-located according to the cab roof, offers the driver significant benefits in terms of confort, safety and health. 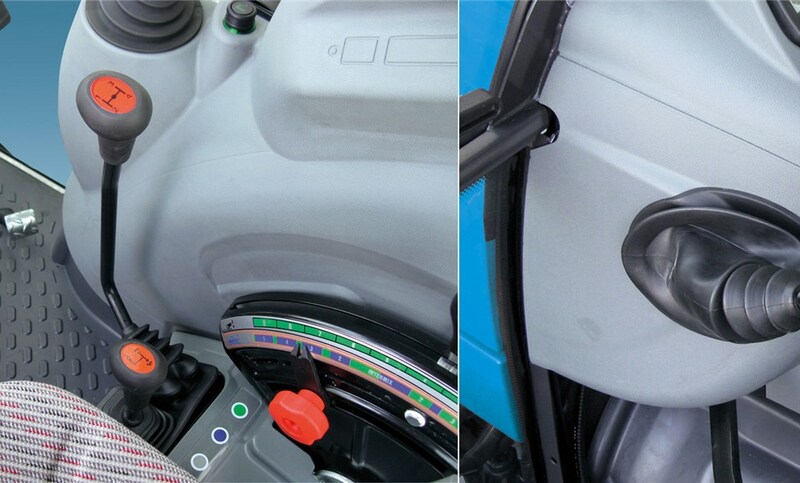 The ventilation system is integrated by two filters designed to purify the air inside the cab. 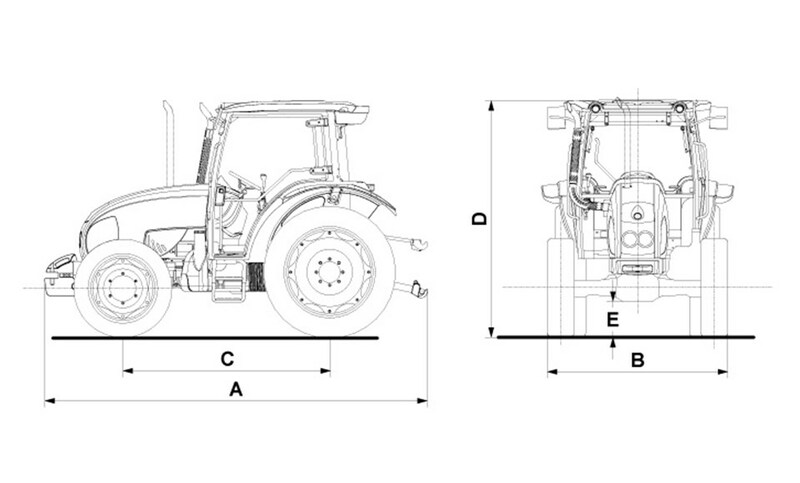 Optionally, the cab can be provided with activated-carbon filters, to protect the operator during pesticide spraying. The roof features a fixed clear sunroof for working with front loaders, and four lights for night work. Natural ventilation is ensured by the opening front and rear windscreens. 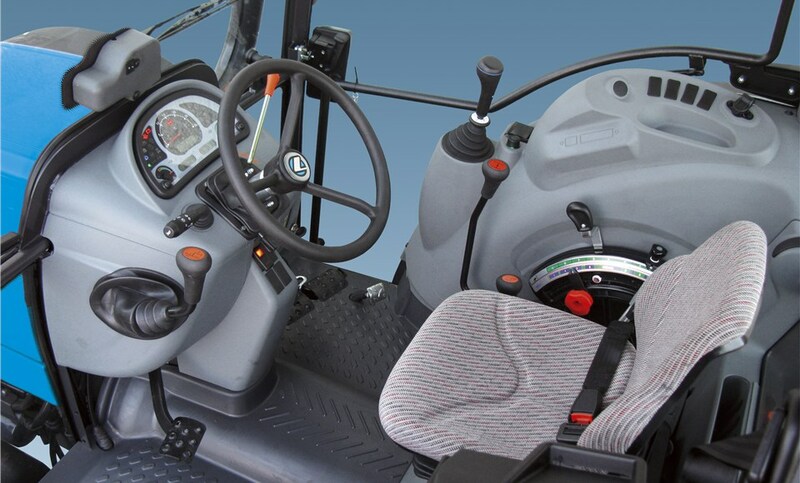 Also the iso-mounted platform offers an ergonomic driving position with adjustable maximise the driver's confort. The two-post rops can be equipped with a sun canopy as an option. The mechanical hitch provides a maximum total flow of 82 litres/min. The hitch, equipped with a cat. 2 three-point linkage, provides position, draft, intermix and float control functions and ensures a maximum lift capacity of 4350 kg. The system features up to 4 remote valves, two of whichcontrolled by Joystick for front loader work, and two controlled by standard levers conveniently located beside the driver’s seat.